Phonographic Copyright (p) – Babygrande Records, Inc. Copyright (c) – Babygrande Records, Inc. Written by: K. Maguire (K. Maguire Music Publishing Designee) / I. Taggart (I. Taggart Music Publishing Designee) / A. Brown (A. Brown Music Publishing Designee). 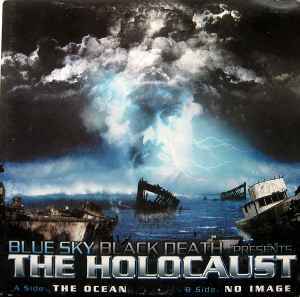 Both tracks taken from the album "Blue Sky Black Death presents The Holocaust". After having picked this record up totally by random because of it's dope cover art I was really surprised to find out that the b-side is one of if not the best tracks I've heard this year. Ok, the raps are pretty normal Wu-Tang affiliate gibberish but at least Holocaust's voice has more edge than your average rappers'. Still it's the beat that makes this track so damn nice, I hadn't heard about Blue Sky Black Death before this and they rose straight to my favorite producers. The way this track evokes feelings is something many producers just can't do. Haunting strings, perfect placing of the female voice sample and the violin solo at the end make this track both uplifting and depressing at the same time which I strangely found to be a key factor in making some instrumentals so good. :) Easily the b-side instrumental alone is worth the price of this single.